Welcome Members of Curvy Hoopers Unite! I am thrilled you are ready to learn how to hoop dance and honored that you are interested in the Learn to Hoop at Home online course. If you have any questions, please ask in the CHU thread so that everyone can see my answer. Otherwise, please enjoy this ‘curvies only’ 24-hour pay-what-you-can sale. What if I told you there was a way you can learn how to hoop dance from the comfort of home without spending hours searching through online tutorials, straining through grainy video and poor audio? 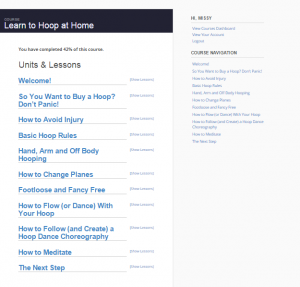 The Learn to Hoop at Home online course takes you from zero hooping experience, to dancing easily in your living room, in just a few weeks. And now, for 24-hours only, this $97.00 course is available to CHU members on a ‘pay-what-you-can’ scale. Seriously, pay whatever you are able and get full lifetime access to everything inside. Click the boxes below to learn more, then when you’re ready to get started, follow the directions at the bottom of the page. What Is Learn to Hoop at Home? Learn to Hoop at Home is an online classroom that teaches you how to go from zero hoop dance knowledge to dancing easily in your living room, in just a few weeks. 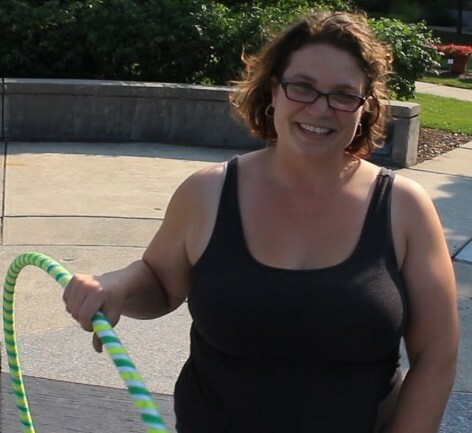 Instead of aimlessly wandering the internet for hours, trying to teach yourself trick after trick, and wondering how they all fit together, Learn to Hoop at Home makes it easy by categorizing several beginner hoop dance tricks and concepts, and clearly laying them out with high quality video, downloads, and other resources that take away any fears or frustrations you have about hooping. How Many Tricks Are Included? Learn to Hoop at Home teaches you basic hoop dance techniques, rather than trick after trick with no cohesion. This means you won’t be overwhelmed with several different tricks to learn, and no idea how they go together. Still, learning new tricks is one of the most fun things about hoop dance. There are 10 high quality videos included in the Learn to Hoop at Home online course, each focusing on a specific aspect of hoop dance. Within each video, you will learn a few basic techniques that cover a large variety of tricks. It’s hard to say just “how many tricks” because each technique can be expanded into several different combinations and variations, depending on your own level of commitment. If you follow along and never expand on anything you learn, you’ll still find at least 18 different tricks and variations inside the course. Plus, you’ll get a full 16-beat choreography that can be used in 100s of songs, a stretching workout, and a guided meditation. 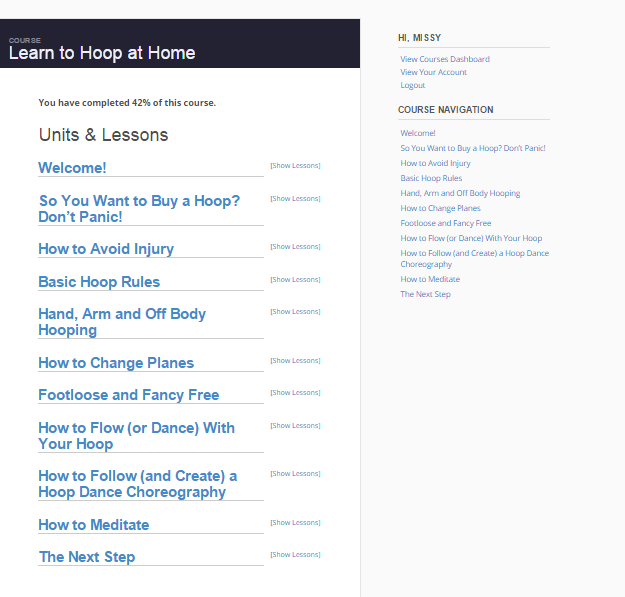 Learn to Hoop at Home is a virtual program that is available to you 24 hours a day, 7 days a week. Once your membership is accepted, you will be given a private login and password and a link to access the course. Once inside you will find all of the tutorials are shot using high quality audio and video so that you never have to strain to see or hear what’s going on. 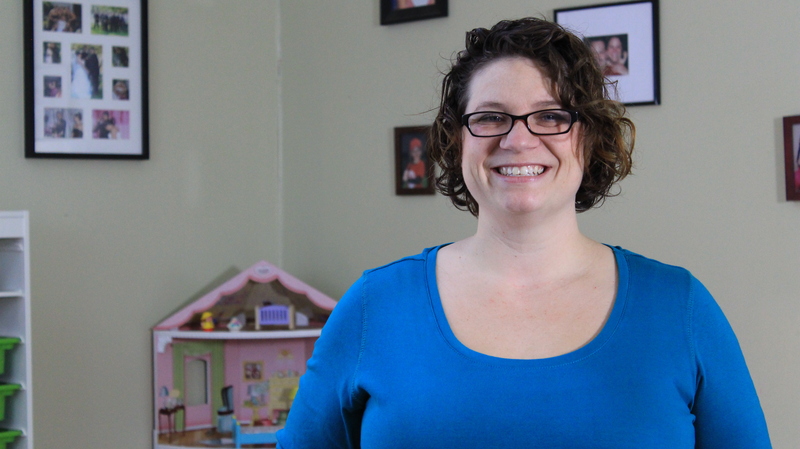 Each tutorial includes multiple views and slow motion shots so that you can easily see what your body is supposed to do. Learn to Hoop at Home also includes detailed playbook filled with pictures, instructions, and tips on how to master each technique. Additionally you’ll receive thorough guides showing you how to apply what you’ve learned in each lesson to your daily practice, and how to combine it with what you already know. The course is hosted online so you will need access to the internet. The videos are available via streaming or direct download. Is Learn to Hoop at Home Right for Me? Learn to Hoop at Home wasn’t shot in a fancy studio, gym, or some exotic paradise. 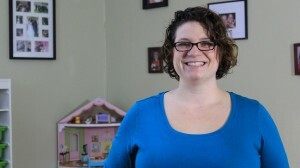 It was shot in my own living room, in about a 6 ft space. There are no bikini clad hoop girls or intimidating midriff shots of flawless bodies anywhere in this course. You don’t have to be perfectly fit to be a hoop dancer. I’m certainly not. I don’t even have a dance background. It doesn’t matter if you’re too fat, too short, too tall, too skinny, or whatever else you think is holding you back from hooping. Anyone who wants to learn how to hoop dance can do it. And you don’t have to be embarrassed because it’s just me in my living room. And you in yours. Lifetime access to Learn to Hoop at Home normally costs $97.00, but for 24 hours only, curvies can purchase it a ‘pay-what-you-can’ price point. Just complete the price box below with whatever amount you are able to pay and click “Buy Now”. Then keep an eye on your email (the one you used to purchase the course). 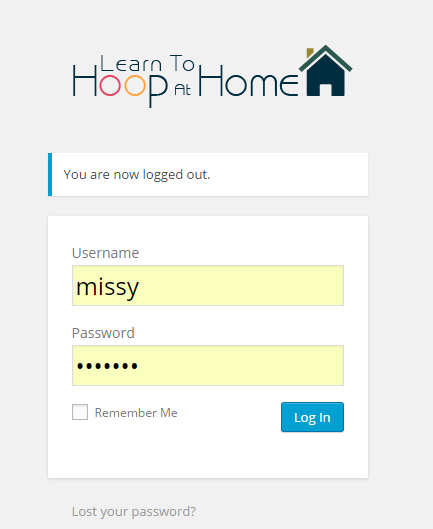 You will receive your Learn to Hoop at Home username and password, and a link to sign in, within 24 hours. If you have any questions, just ask. Otherwise, I’ll catch you hooping on the other side!